Are Airports Becoming the New Malls? Today, airports are transforming from mere transit centers to becoming more like shopping malls, positioning these facilities perfectly to leverage the benefits of digital signage. Modern society continues to rely on digital forms of communication and digital signage in airports is no exception and is fast replacing outdated static displays. Digital signage and kiosks are powerful tools that airports and airlines can use to communicate with travelers in a clear and convenient way. Waiting for flights, grappling with unexpected delays, navigating an airport and tracking lost baggage are common issues that can test the patience of passengers. Let’s explore how digital signage and airport kiosks can help alleviate these challenges and improve dissemination of important passenger information while keeping passengers engaged. Airports can be confusing whether there are two terminals or eight. No two are alike and navigating can be challenge. Dynamic digital signage helps passengers figure out where they are going, whether they’re just trying to find a bite to eat or their connecting flight. Traditional way-finding displays are often static and can only show limited types of information. With added color, animation and self-service functionality, digital way-finding signage is a convenient solution that provides travelers easy to follow airport navigation. These displays are often equipped with touchscreen maps of an airport’s layout, that help passengers navigate finding the check-in counter, baggage claim, boarding gates, restaurants, restrooms, stores or lounge areas. Boarding passengers need critical information before they depart. Gate information display systems (GIDs) are useful digital signages that ease the boarding process because they contain information relating to boarding zones, departure times, and flight numbers. Flight information display systems (FIDs) are also important signages that show flight updates, changes, or delays at both departure and arrival areas. For arriving passengers, baggage information display systems (BIDs) show the location of luggage belt areas where passengers pick up their baggage. Nothing is more frustrating to passengers than a delayed or cancelled flight. Digital signage in airports provide real-time updates on the status of flights to help manage passenger expectations. News updates on weather, including disasters and technical issues, help passengers understand their plight. Keeping passengers informed is one of the best ways to avoid frustration and complaints. Airports are busy hubs where thousands of people come and go. 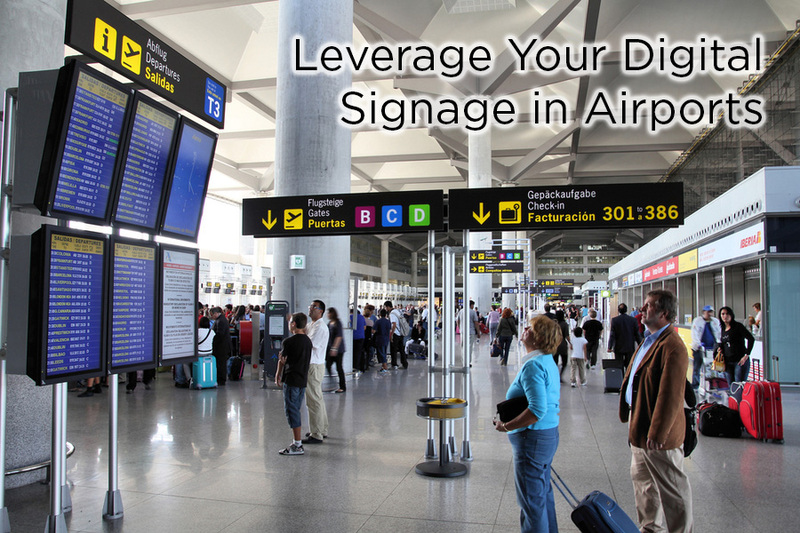 Digital signage systems are helpful tools that can be incorporated in an airport’s digital marketing strategy. For instance, the signages can feature advertising material on branded menu items to attract more sales in the airport’s food court. They can also be used to provide information about local hotels, restaurants, and tourist spots to enhance the visitor experience, while promoting local tourism. While providing essential information about flight details and emergency situations, digital signage systems and airport kiosks don’t have to be one-way communication devices. Connected airport kiosks are a great way to engage passengers and encourage them offer their feedback and concerns. While airport administrators have found ways to improve the passenger experience using digital signage and airport kiosks, leaders of other verticals are exploring parallel benefits to serve their customers well. The touchscreen functionality found in today’s mobile devices, such as smartphones and tablets, is finding its way into the digital signage sector. Inactive screen technology is accelerating demand for digital display systems ranging from small touchscreens used in kiosks to large video walls in major malls and hotels. The global digital signage market is forecast to grow by a compound annual rate of 8.21 percent through 2022 as reported by ReportBuyer, an online store for market research studies. This is encouraging and AV integrators, savvy businesses and marketers should be able to leverage the advantages of digital signage to improve customer service. Home Blogs alpha's blog Are Airports Becoming the New Malls?